This compelling study by Rebecca Peabody convincingly explains Kara Walker’s narratives, clarifying how to read the stories conveyed in many of her works within historical context(s). She shows how they intersect with popular nineteenth- and twentieth-century narratives about race found in “literary fiction, Harlequin romance novels, television, and Hollywood films,” (2) as well as other visual culture, such as book illustrations. Examining Walker’s “tension between ambiguity and legibility, the power of narrative, and the presence of shared visual memory as a conceptual framework,” (22) Peabody observes that Walker’s “intertextual conversation and appropriation” (56) exposes “the ongoing process of American racial formation—how fiction operates as a form of national-making.”(2) Such a description also applies to Peabody’s text, which intersects with Walker’s images and the artist’s characteristically lengthy and descriptive, yet often ambiguous, titles of artworks, notes, and commentary from interviews, exhibition catalogues, artist’s books, and exhibitions. As Peabody accurately maintains, many scholars “make reference to” Walker’s “engagement with narrative fiction” (2) but fail to fully flesh out how to understand Walker’s confusing, haunting, arresting, and often scatological images, which force the viewer to confront the “alignments of race, power, and desire” in the United States. (3) She extends our understanding of many of Walker’s artworks that other scholars have discussed while focusing on some that have not received as much scholarly attention. Besides elaborating upon the intersection between Walker’s images and narratives in American culture, Peabody also uniquely considers how various international cultures understand her works within the context of the United States, global history, and concerns about race. In her conclusion, which examines Walker’s A Subtlety or the Marvelous Sugar Baby, I wish Peabody had elaborated on the complex meanings of the work’s extended title: an Homage to the unpaid and overworked Artisans who have refined our Sweet tastes from the cane fields to the Kitchens of the New World on the Occasion of the demolition of the Domino Sugar Refining Plant.4 Peabody does explain how the sculpture “is about ruins and about hope” and appropriately discusses Walker’s Digital Sugar Baby, an interactive website in which viewers could add their photographs of the installation, and An Audience, a video that shows how viewers interacted with her sculptures. (161) It is possible that Peabody saw Walker’s elaborate installation of the sphinx made of sugar and the fifteen five-foot-tall processional figures, comprised of either a mixture of brown sugar, corn syrup, and water or resin coated in molasses and sugar, so close to the completion of her book manuscript that she did not have time to elaborate on the meanings of the work and its varied narratives. This criticism, however, should not detract from the overall assessment that this excellent book contributes greatly to the plethora of existing scholarship on Kara Walker. 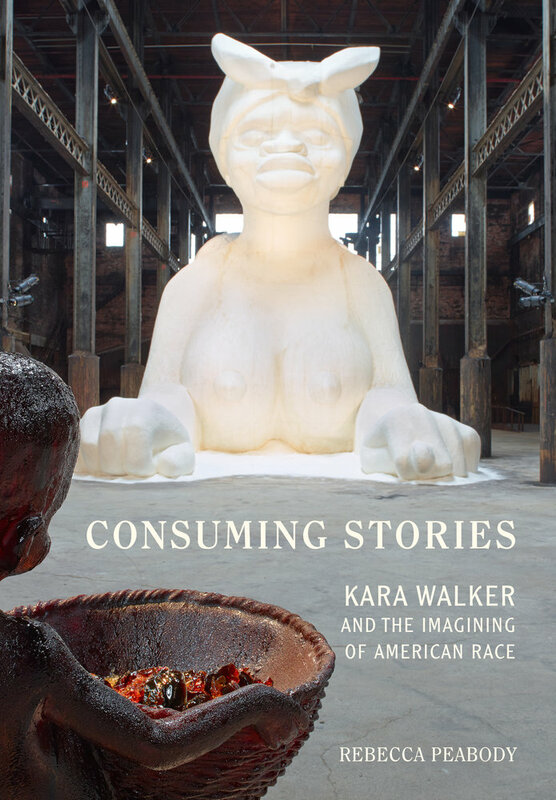 Cite this article: Vivien Green Fryd, review of Consuming Stories: Kara Walker and the Imagining of American Race by Rebecca Peabody, Panorama: Journal of the Association of Historians of American Art 3, no. 2 (Fall 2017), https://doi.org/10.24926/24716839.1618. About the Author(s): Vivien Green Fryd is Professor of Art History at Vanderbilt University.